Blog » Health » Top 10 Foods to Stop Hunger and Cravings For Hours! Top 10 Foods to Stop Hunger and Cravings For Hours! How often have you felt your tummy talking, okay shouting to you for hot pizza, crunchy chips, donuts, ice cream, or chocolate? You know, mid-way between breakfast and lunch or between lunch and dinner? It is not a given for you to be hungry or experience cravings EVER! I have compiled a list below of foods that will help you sail through the day without hunger or cravings..it works for me and it can work for you too. Remember that the ‘type’ of foods you put into your body will shape the health and body you want. Nutrition is 80% of your success! Cayenne pepper can not only speed up metabolism but it is an effective appetite suppressant. The hotness factor of cayenne pepper comes from capsaicin, a compound found in many hot peppers. Capsaicin causes the body to produce extra heat and burn more calories for fuel. The body’s metabolism can increase 15 to 20% for up to two hours after ingesting foods with capsaicin. Turkey is loaded with Tryptophan, an amino acid that when it enters the brain, it is converted to serotonin, the feel-good neurotransmitter that not only makes you feel good, it turns off the appetite and hunger or cravings are a distant memory. Oatmeal contains insoluble fiber that will help you reduce your appetite so you can experience weight loss. This fiber slows down the digestive process, balances blood sugar so you can feel fuller, longer. The key is to use non-instant oatmeal. Instant oatmeal is processed and is not as effective as it spikes blood sugar levels leading to hunger and cravings. “An apple a day can keep your fat away” Eating an apple before or after meals will help you feel full in a hurry and this fullness will last longer. The pectin in apples will help keep you full 1-2 hours after you eat one. Apples are one of the best snacks that will help balance blood sugar and this means it will help prevent you from making poor snack choices. Almonds contain phenylalanine, an essential amino acid that triggers the release of Cholecystokinin (CCK), a hormone that acts as an appetite suppressant. It slows down the digestive process that allows the brain to recognize your tummy is satisfied. Just a handful of almonds, about 15 almonds, is all it takes. Just sniffing the smell of peppermint (which is calorie free) can stop cravings and turn off your appetite. The scent hits nerve receptors in the nose that in the end, triggers hormones to be released that tell the brain you are satiated. Try chewing on the leaves or adding a couple drops of pure peppermint oil to your drinking water to help quell your cravings. Foods rich in unsaturated fats such as avocados send the message to your brain to stop eating. An unsaturated fatty acid called oleic acid stimulates production of OEA, which in turn decreases appetite by creating a feeling of fullness. 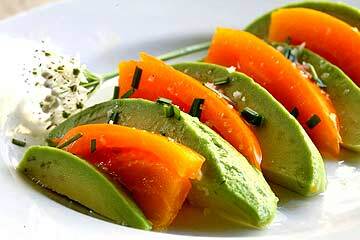 Avocados are also rich in fiber which further helps tamp down the hunger pangs. Whey protein increases the hormone cholecystokinin (CCK), the hormone responsible for appetite regulation and that quells hunger or cravings and reduces levels of the hunger hormone ghrelin better than other types of protein, which helps improve hunger control. The body requires more energy to digest protein than other food, which causes an increase in metabolism. This in turn, results in a higher potential to burn calories than either fat or carbohydrates. Whey protein also helps build muscle and boost your immune system. An egg has only sixty calories and its high protein content makes it a natural appetite suppressant. Studies have shown that people, who eat eggs for breakfast, lose twice as much weight as those who don’t have eggs. High protein foods such as eggs increase secretion of an appetite suppressing hormone known as PYY which helps to suppress hunger naturally. Whether they’re scrambled, boiled, or poached, eggs are a good choice for breakfast or even a mid-day snack to help prevent nagging hunger and cravings for hours. Beans will fire-up your fat burn and keep you full for hours. They will not only keep your metabolism primed, but will also reduce blood sugar, and create the fatty acid butyrate, which may burn fat faster. Enjoy beans in a salad, in a dip or as a side dish. Okay..water is not a food but is critical. Drinking just two eight ounce glasses of water before meals will help you not only to feel fuller, but to lose weight as well. Water is very effective because it fills up the stomach allowing people to by-pass the calorie laden foods, make healthier food choices and not want to eat as much. The brain confuses thirst with hunger as well, so a glass of water is really what you need..not food. Also, even more weight loss will result if water is swapped for soda. These foods will enable you to not only stop hunger and cravings and allow you to be in control of what you choose to eat, but to create optimal health as well…a win-win.